Ella survived the long trip from Florida to join our household. Wow, is she tiny compared to our big horse of a boy (over 25 inches at the shoulder and 80 lbs so far)! 12/7/03: Ella is on her way! Charlemagne is not going to be an only dog for much longer. Ella was whelped on December 4, 2003, along with eight other siblings (6 girls and 3 boys total). She will be coming to us from Topbrass Retrievers in Florida. 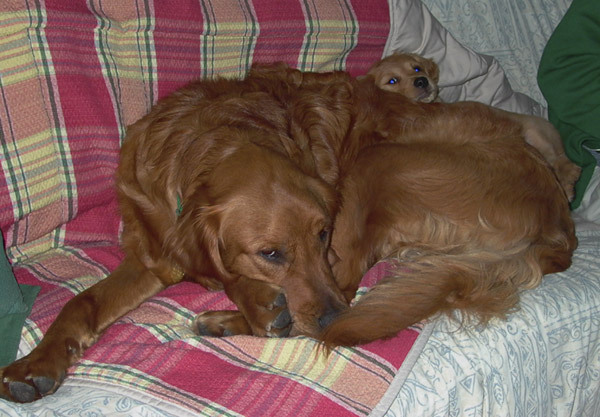 Ella is a result of a breeding between Nealcrest Super Sleuth (Jessica) and AFC FTCH AFTCH Can. OTCH TNT's Explosion Am. UD (Boomer). Click here for more information on this breeding. We're really looking forward to adding Ella to our household and if Charlemagne knew that he's about to have a permanent playmate-in-residence, we're sure he'd be excited too. Right now, though, he's more interested in destroying every single potted plant in the backyard. 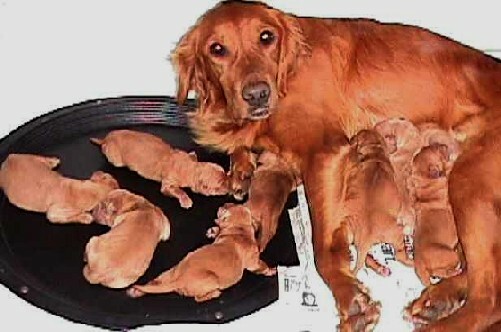 Here's a picture (courtesy of Topbrass Retrievers) of Jessica with her litter, at 3 days old. ©2008 Jessica Chia. All Rights Reserved.